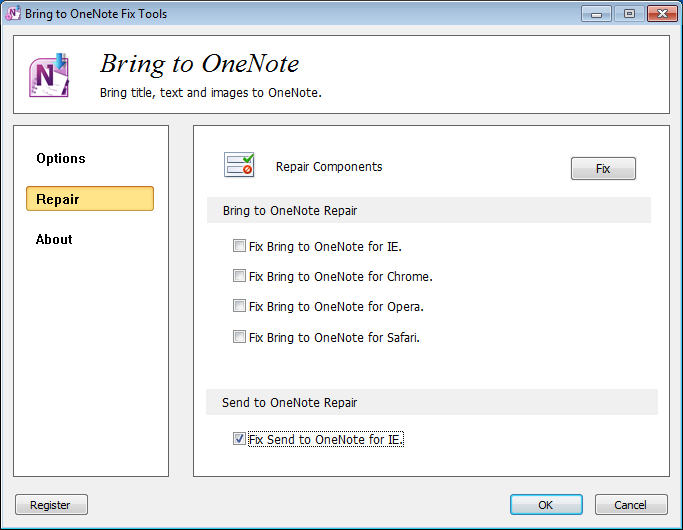 Bookmark web page hyperlink to OneNote 2013, 2010, 2007 from Browsers (IE, Chrome, Firefox, Opera). These add-ins extend browsers bookmarks bar. We can collect and organize a lot of the links with OneNote now.ccess row. How to use Favorite to OneNote 1. Bookmark a web page hyperlink to OneNote. In ie or chrome or firefox, like "Bookmark" button to bookmark a web page hyperlink. Right click on the web page, and in the popup context menu, click on "Favorite to OneNote", this will create a hyperlink with the web page title in current OneNote page. 2. Bookmark a link's hyperlink to OneNote. In ie or chrome or firefox, right click on the a link text, and in the popup context menu, click on "Favorite to OneNote", this will create a hyperlink with the link text in current OneNote page. We can use OneNote tables to organize a lot of links, that will easy to classification, will be more easy to read.